The Center for Climate Protection just released its Greenhouse Gas (GHG) Emissions Report for Sonoma County for 2014. The report calculates GHG emissions from major sectors to reveal trends that demonstrate progress toward the County’s goals. The report shows us that in 2014, Sonoma County produced about 3.6 million tons of greenhouse gas (GHG) emissions. This is a decrease of about 14% from 2007, when county emissions reached a high of about 4.2 million tons. “It’s too soon to tell if this is a trend we can count on, but we believe that we’re bringing emissions down in a real and hopefully accelerating way,” said Ann Hancock, Executive Director of the Center for Climate Protection. The Center has been tracking the county’s greenhouse gas emissions since 2003. The launch of Sonoma Clean Power in 2014 brings reasons for hope. Sonoma Clean Power customers receive greener electricity, which promises to play a critical role going forward. The Sonoma County Water Agency, one of the largest energy users in the county, achieved its goal of operating a carbon-free water system, procuring 100% of its electricity needs through renewable sources, thanks in part to Sonoma Clean Power. Transportation, however, is by far the county’s largest culprit of carbon production, accounting for about 65% of Sonoma County’s total emissions. But there’s hope here, too. According to the Center for Climate Protection’s soon-to-be-released draft report on electric vehicles, Sonoma County can significantly reduce transportation emissions by shifting from gas and diesel-powered vehicles to those powered by electricity. Although Sonoma County is a climate protection leader, this report shows that there’s a long way to go. 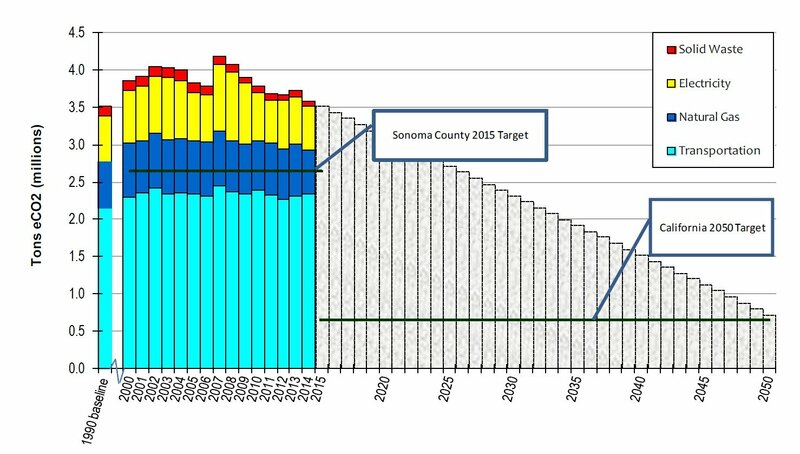 Sonoma County is aiming for a 2015 target of reducing emissions 25% below 1990 levels, equal to about 2.6 million tons of carbon dioxide, by 2015. In 2005, Sonoma County and all nine of its cities pledged by resolution to achieve this goal, which corresponds to what is known scientifically as atmospheric carbon stabilization, the imperative for a life-sustaining climate. To meet the goal, emission reduction measures must overcome powerful forces, particularly increases in population and an economy largely based on fossil fuels. Reducing GHGs is much more than an environmental agenda. It is about public health, energy security, economic vitality, and ultimately, human survival. In the words of Pope Francis, “we have a moral imperative” to promote climate action, and it will require a “bold cultural revolution” to get us on the right track. Sonoma County is proving to the world that reducing GHGs and promoting decarbonization also makes long-term economic sense. “Ultimately, social change happens through our conversation. The more we talk about this imperative, the solutions, and each of our roles in correcting this crisis, the faster we create the context for change and create a positive future for our children and all life,” said Hancock.